Happy Monday, everyone! I'm a bit under the weather today, so I'm sharing a very simple and inexpensive craft idea that I've had in my drafts for awhile. With summer fading away, how do we keep those beautiful sunny memories close to our hearts? 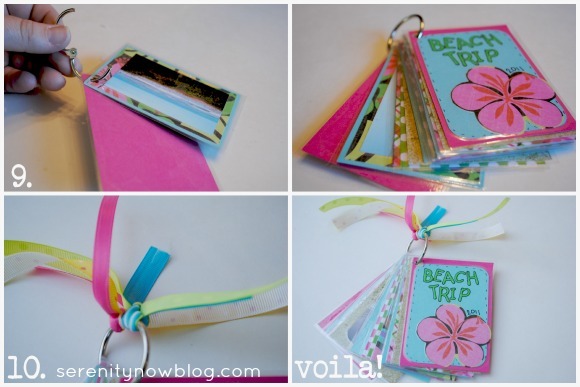 I made a Mini Keyring Photo Album last year to display our beachy memories and I shared it as a guest post on another blog. Today, I'll show you how easy it was to do. The beauty of this gift is that you do not need to be a scrapbooker to put one of these together! 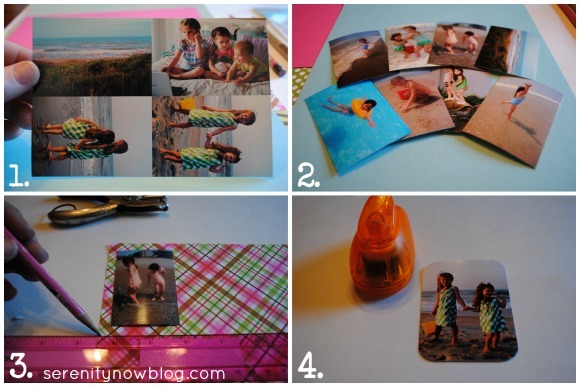 Anyone who can print a photo and cut a straight line can complete this project. You can print wallet-sized (2 x 3) photos at any Kodak kiosk (I use the one at Target) by choosing the Collage and Mini Print options. This will print 4 photos on a 4 x6 sheet. I spent less than $2.00 for 6 sheets. I recommend having 10 to 12 photos to work with. 3. Lay your photos on the scrapbook paper and measure out "mats"
Be sure to leave enough room in the top left corner for a hole punch to go through. You'll notice I also made a "cover" for my album, using a flower from the scrapbook paper. Too many layers of embellishments can make the laminate tough to adhere, so use them sparingly. Be sure they leave some space between the album pages when they laminate them. Less than $2.00 at my local shop. Laminating is clearly not the best thing for your pictures, but it helps the album with wear and tear. If you trim too closely to the edge of the paper, the laminate could peel open. If you made a back cover for your album, be sure to punch through the opposite side. There are so many fun themes to choose from! 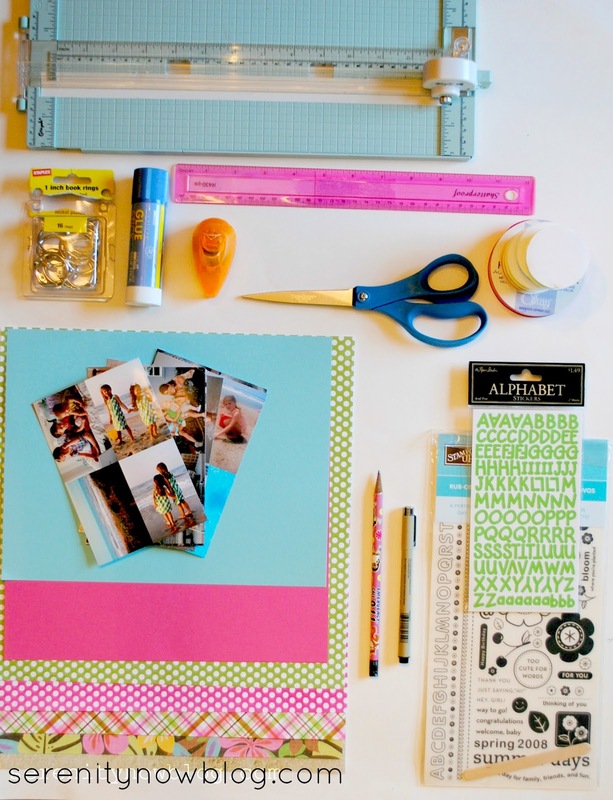 You could create albums for Holidays, Back to School, Grandparents, Favorite Things, Sisters/Brothers, Pets, Recipes, etc. These are a big hit in our family. I made one with copied heirloom photos for my husband's grandparents several Christmases ago, and they loved it. Gifts like this are perfect for those hard-to-buy-for folks, or older relatives who don't really need or want anything. Grandmas love to carry these in their purses to show off. I keep mine in a little tray on our coffee table with some photo books. People appreciate the love that goes into a handmade gift, and I love having a fun little reminder of our summer fun on display! *I'm over at At the Picket Fence today, sharing my recipe for Chocolate Chip Cookie Pie. If you haven't met Heather and Vanessa yet, you must stop by! This is an adorable idea! Especially for a vacation. My Mom joins us sometimes on vacation. This would be a great gift for her once we get home. Thanks for sharing. Thanks for Sharing this! 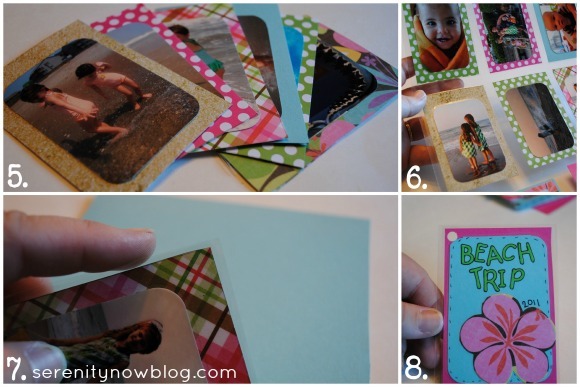 I love scrapbooking, but I'm so far behind I never get to work on current pictures, this looks like a quick and easy solution. Can't wait to try it! Amanda that turned out so cute! I love the cover and the cute ribbon on the ring! I have yet to do anything with all the stuff from our vacation this summer...it is still in a paper bag waiting for me! So darling and clever! My mother-in-law would love this. I think these might show up as some Christmas gifts. 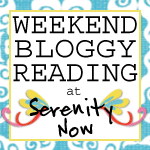 ;) Thanks or sharing the tutorial and for hanging out with us over At The Picket Fence! Appreciate you Amanda! I remember this sweet idea! Love it! How adorable! Thanks for sharing! 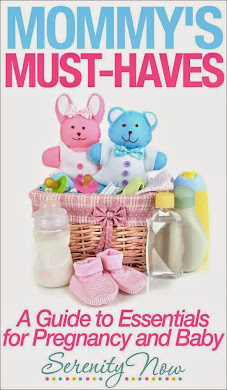 This is so cute and does make a perfect gift for a relative who doesn't need anything for a gift. This is soooo darling!! 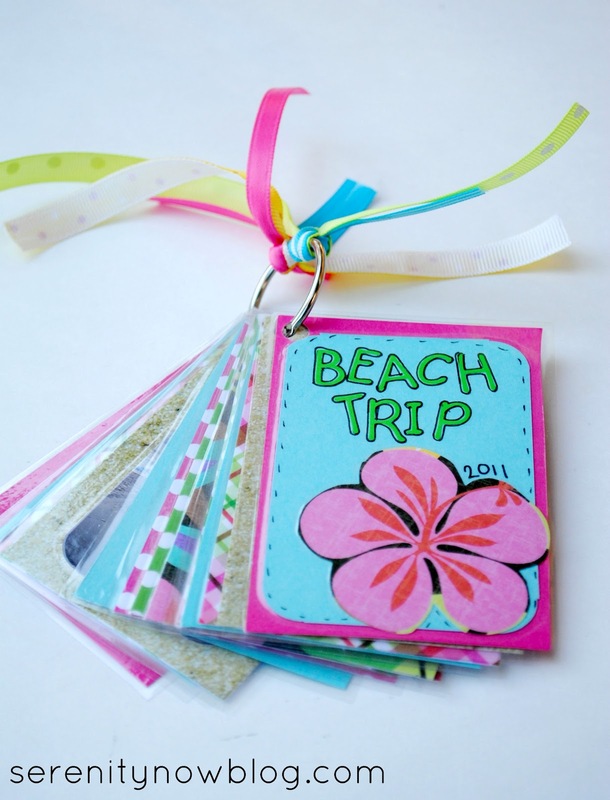 What a sweet way to remember a trip or some fun event! I love it! This is sooooo cute! I love it! What a neat idea. Could any of you follow my blog? Please! I will follow back! Love this idea! Such a great way to capture some fun memories when you've run out of frame space! 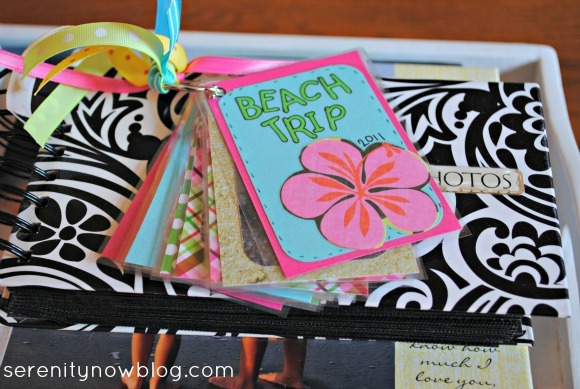 such an awesome idea to remember a fun trip! That's so cute! I wondered where you were able to print out a sheet with four different images; I haven't used a Kodak kiosk, so that's good to know. oooh! I love this idea! You had such a wonderful idea!